Earlier this summer the Fredericton Playhouse announced their 2016-2017 Spotlight Series, which will see 31 of the most exciting artists touring today grace their stage from September to May. The Spotlight Series is our flagship program at the Playhouse. It’s the label under which we present professional touring artists and companies performing classical, contemporary and traditional shows in music, theatre and dance. Diversity is the cornerstone of the series as we aim to offer a variety of performances, from large-scale productions to small, intimate shows, providing something to suit every taste. There are a number of reasons why the Spotlight Series is an important part of what we do at the Playhouse. To begin with, it fills gaps in performing arts offerings in our community. We are the only organization in Fredericton that presents professional touring dance companies, for example, and our dance programming has grown substantially in recent years. We are continuing to take the Playhouse’s dance offerings to new levels in 2016-2017. This season includes three contemporary dance companies from Vancouver, a Bollywood fusion group from Toronto, and Le Patin Libre, a Montreal-based company that performs high-level, artistic dance on ice, and will give a performance at the Willie O’Ree Centre in February. The Spotlight Series provides us with opportunities to work with like-minded organizations in our own community. This program wouldn’t be possible without our public-sector funders and our season, media and performance partners. We’re also thrilled to be working with groups such as Centre communautaire Sainte-Anne to present a number of French artists, and with the Harvest Jazz and Blues Festival to present blues performer Guy Davis in our Kidstage Series. This year, we’ve also developed a new partnership with the Association of Indo-Canadians to present a special celebration of Diwali, the Hindu celebration of lights, in October. This event will include an exciting dance performance, as well as workshops, henna art and cultural cuisine, and promises to be both an incredible cultural celebration and an outstanding performing arts event for our community. Each year, as our team works to make this series happen, we think about how we can “bring the world to Fredericton.” For many of us, travelling to far-flung locales like China, Austria or Spain to see live performance isn’t a feasible option. That’s why we’re so excited to present artists from each of these countries during the upcoming season, with performances by Immortal Chi, a Chinese martial arts and acrobatic group; the Vienna Boys Choir; and Las Migas, an all-female flamenco music quartet. We are also looking forward to welcoming artists from eight Canadian provinces, and from New York, Louisiana, Missouri and Minnesota. This season includes a large number of familiar names from Atlantic Canada, from rock band Sloan, celebrating the 20th anniversary of their hit album One Chord to Another, to Cape Breton-based traditional band Còig, performing a special Celtic Christmas show. We try to include a few unexpected performances in our Spotlight Series, and I always encourage our patrons to branch out and try something new. I’m thrilled that we were able to include Tanya Tagaq this year, as one example. She creates a unique vocal expression rooted in Inuit throat singing, while incorporating electronic, industrial and metal influences – it’s exquisite, unnerving, and quite unlike anything else you’ve heard. We also have a couple of innovative theatre performances fresh off the fringe circuit from Canadian performers, like This Hour Has 22 Minutes actor Gavin Crawford’s hilarious take on social media, “FRIEND” “LIKE” #ME, and New Brunswick’s own Nancy Kenny, who will perform her piece Roller Derby Saved My Soul in our intimate backstage space. The Spotlight Series is also intended as a vehicle for audiences to have memorable experiences with friends and family, which is why we include performances appropriate for all ages. 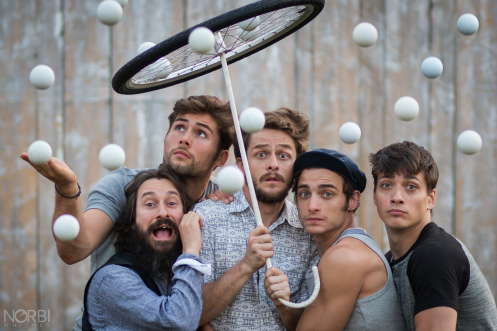 One example this season is Machine de Cirque, a young, contemporary Quebec-based circus company that puts on a spectacular show, full of theatrics, acrobatics and juggling. This is also the key tenet of our Kidstage Series, announced earlier this year. In the season ahead, this series will include three shows – returning favourite DuffleBag Theatre with ‘Twas the Night Before Christmas, Lightwire Theater’s Moon Mouse: A Space Odyssey, and aforementioned bluesman Guy Davis. These shows are presented to help introduce young audiences to the magic of the performing arts, while creating lasting memories. For households planning to attend multiple shows this season, I would recommend becoming a Spotlight Member. For a low annual membership fee, members receive discounts on Spotlight and Kidstage Series performances, as well as discounts on our partners’ series – Theatre New Brunswick, Atlantic Ballet Theatre of Canada, Symphony New Brunswick and New Brunswick Country Showcase performances. But likely the best reason to become a member is to get first access to seats. While full-price tickets won’t go on sale to non-members until later this summer, our members can purchase tickets and select their preferred seats now. However you choose to participate, I hope to see you at the Playhouse when our new Spotlight Series begins this September. The line-up truly has something for everyone, and provides an excellent opportunity to experience a wide world of performing arts right here at home. Tim Yerxa is the Executive Director of the Fredericton Playhouse. For more information or to purchase tickets to events visit www.theplayhouse.ca.